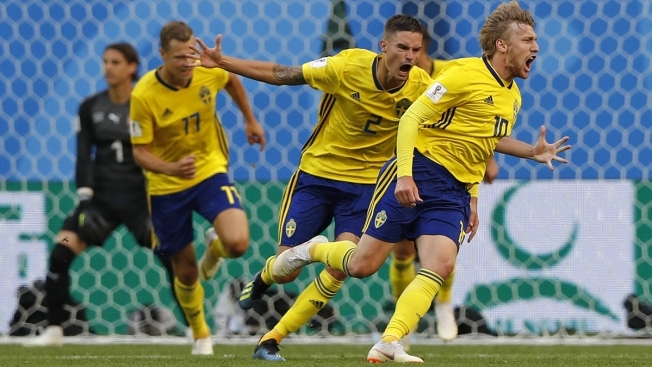 Sweden's Emil Forsberg, right, celebrates with teammates after scoring the opening goal during the round of 16 match between Switzerland and Sweden at the 2018 soccer World Cup in the St. Petersburg Stadium, in St. Petersburg, Russia, Tuesday, July 3, 2018. The heir to Zlatan Ibrahimovic finally delivered for Sweden at the World Cup. Later, England defeated Colombia in penalty kicks after the teams finished 1-1. Shy and understated, the 26-year-old Forsberg couldn't be more different than the larger-than-life Ibrahimovic, who ruled the Sweden team for more than a decade and was the greatest player the country ever produced. But Forsberg arrived in Russia shouldering the creative burden left by Ibrahimovic following his retirement two years ago, and the attacking midfielder's skills and slick movement stood out at St. Petersburg Stadium. Forsberg's scruffy shot from the edge of the area was likely heading straight for Switzerland goalkeeper Yann Sommer, but it took a deflection off the boot of centerback Manuel Akanji and landed in the net. England ended a drought in World Cup shootouts to beat Colombia 4-3 on penalties and advance to a quarterfinal match against Sweden.